This Monday morning, July 22, the second phase of our Building Love renovation will begin. 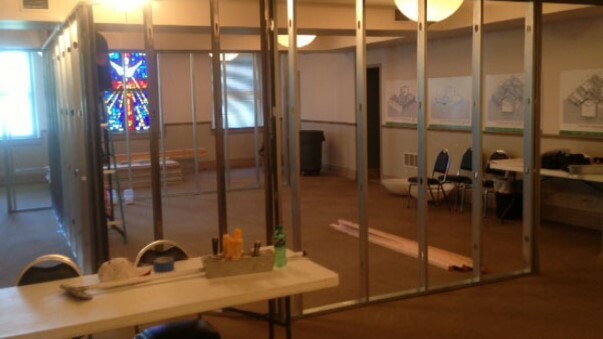 Due to conclude near the end of August, this phase includes construction of a portion of the firewall that allows square footage to be added to the building, as well as the assembly of temporary walls in the Commons that will eventually serve as children’s Bible study space. This phase of the renovation will minimally effect our Sunday and weekday rhythms at Highland. Here are the main things to note as we navigate the next few weeks together! Entry into the church office on weekdays continues to be through the Education Building. A temporary wall will be built near the back of the Commons to act as a staging area for materials that will be used to build the firewall. The Commons restroom and kitchenette will not be functional during this phase. Please use the Fellowship Hall kitchen and the restroom located in the 1st floor education building hallway. On weekdays, the women’s restroom in the Fireside hallway will not be accessible. Please use restrooms available on other floors of the building. There will be no entry via the double glass doors in the central stairwell through next spring when the entire renovation is complete. Should you need to schedule a meeting, please contact the church office to reserve a space and have it added to the church calendar. We will have fewer rooms available for meeting and will need to carefully schedule our available space. We are grateful for everyone’s flexibility as we continue through this season of movement, preparation and renovation. Please stay tuned to the newsletter each week for updates on how your weekly rhythms may be affected by current and future phases of the project.